Chocolate truffles are a delectable treat anytime of the year, and giving them a seasonal flair makes them even more fun. All it takes is a hint of mint, and you will find yourself making these luscious vegan sweets time and time again throughout the holiday season. Coconut milk gives these vegan truffles a creamy mouth feel, and a dark chocolate base gives you a boost on antioxidants. Roll them in anything resembling snow (such as powdered sugar, shredded coconut, or ground up candy cane pieces) or make them sparkle like ornaments with colored sugar or sprinkles. However you top them, these bite-sized finger-licking truffles will disappear in no time! Keep a batch in your freezer for any unexpected holiday guests or for a treat during a cozy family night in. 2. 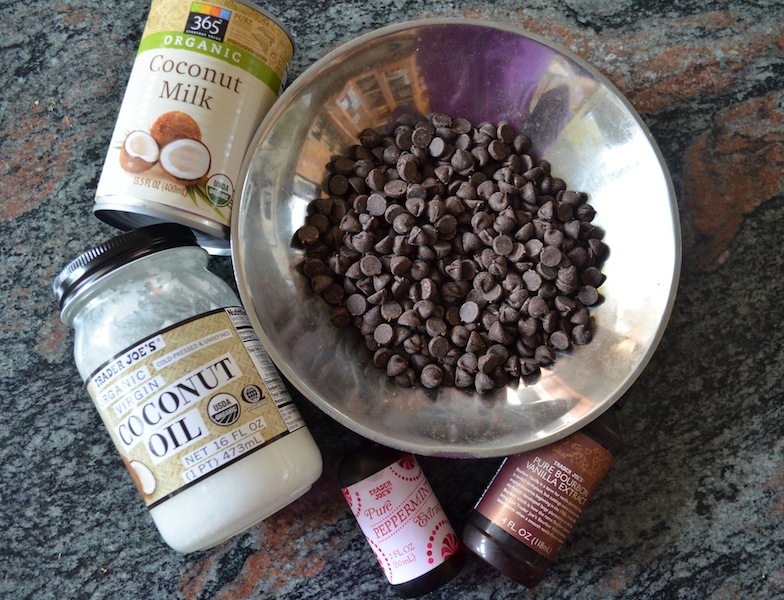 Put the dark chocolate chips and the coconut oil in a heat-proof bowl. 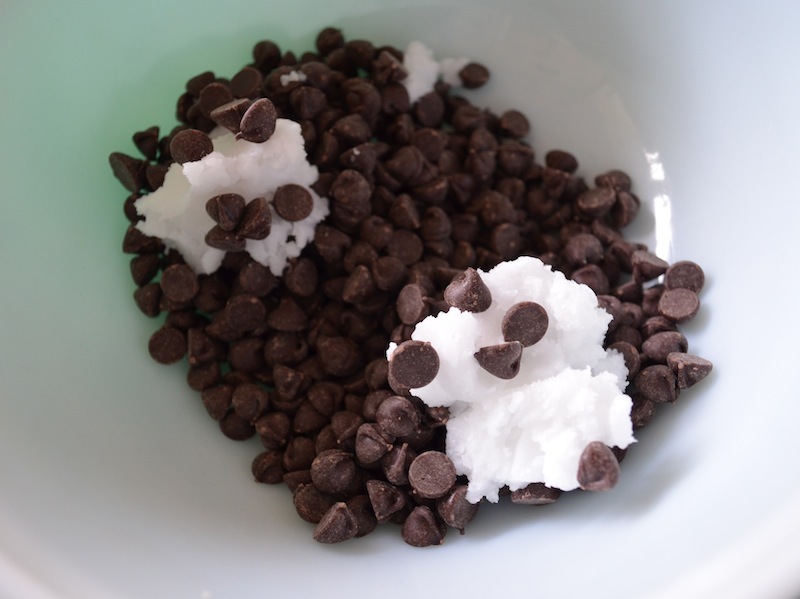 Place the chocolate chips and coconut oil in a medium-sized heat-proof bowl. One of my favorite things about this recipe is not having to use a double boiler! 3. 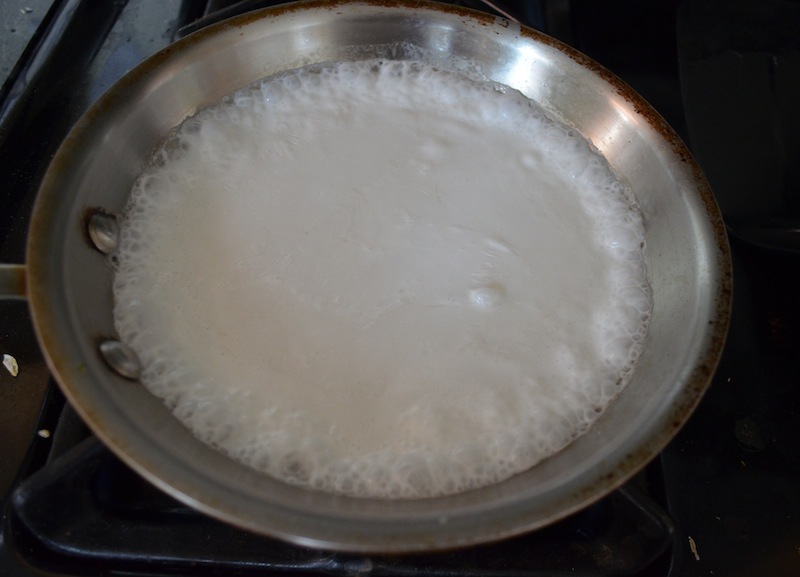 Bring the coconut milk to a simmer. In a small saucepan, add the coconut milk. Heat over medium to medium-high to a simmer. 4. Make the chocolate mixture and cool. Add the heated coconut milk to the bowl with chocolate chips and coconut oil. Stir quickly so that the chocolate chips and coconut oil melt and incorporate into a creamy, chocolate-y mixture. You don’t want to whisk the mixture or it will become grainy. Simply use a silicone spatula and stir until the mixture is smooth and well-combined. Add the peppermint and vanilla extracts and stir gently to combine again. 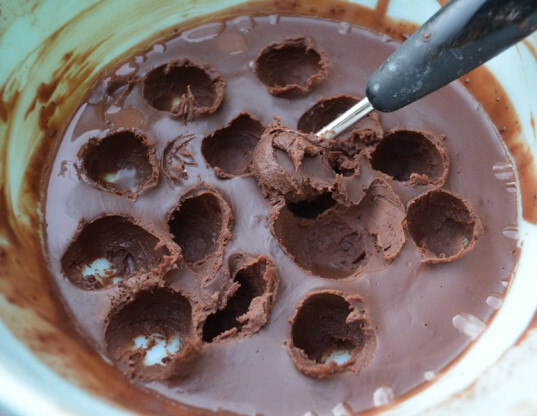 Cover the bowl, and place the chocolate mixture in the refrigerator for about 5-6 hours until it has hardened. You can also place the mixture (covered) in the freezer for an hour and a half to two hours. Either way, you want the chocolate mixture to be firm but scoopable. I tried the fridge method first, then the freezer method and I prefer the freezer method. 5. Make or prepare the toppings. Set out the toppings in wide shallow bowls. 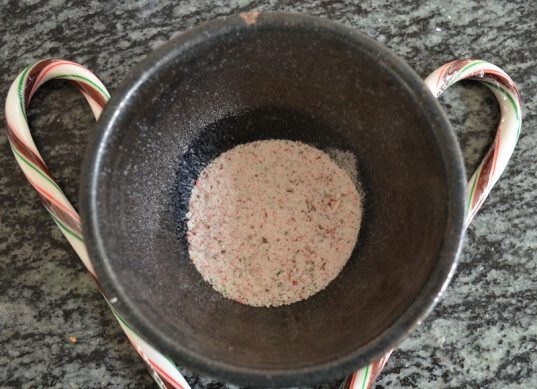 If using the peppermint candy canes, pulverize them in a dry blender until they are very fine. 6. Scoop out the truffles and top as desired. Once the mixture has hardened, use a small melon baller and scoop out the truffles. Working quickly (especially if you are in a warm kitchen), roll the truffles into a rounded shape and then roll them into the toppings if you are planning on serving them soon. Because of the coconut oil in these minty gems, the truffles respond very quickly to heat, so if they start to become too loose to roll, simply place the mixture bowl back into the fridge or freezer for about 10 minutes and then finish the rest of the truffles. 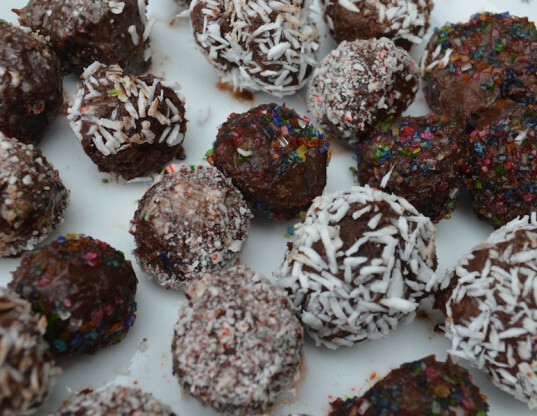 This recipe makes about 32-36 small truffles. Note: If you are making the truffles ahead of time, I recommend rolling the truffles out and leaving them uncoated/topped until you are getting close to serving them (so that the candy cane topping stays crisp and the colored sugar colors don’t bleed.) You can proceed to step 8 and then coat/top them when you take them out to serve. 7. Refrigerate or freeze the truffles until ready to serve. Place the truffles in a container, cover, and return to the refrigerator or freezer for about 30 minutes. Putting them in the fridge obviously makes for a softer truffle. You can also freeze the truffles for several weeks and then set them out for about 5-10 minutes before you are ready to top and serve them. I found that rolling them in coconut made for the best consistency, but I loved the taste of the crushed candy canes! Enjoy! Just made these in different flavors to give to the staff. Very simple and easy to make. Thanks for sharing. Add the heated coconut milk to the bowl with chocolate chips and coconut oil. Stir quickly so that the chocolate chips and coconut oil melt and incorporate into a creamy, chocolate-y mixture. You don't want to whisk the mixture or it will become grainy. Simply use a silicone spatula and stir until the mixture is smooth and well-combined. Add the peppermint and vanilla extracts and stir gently to combine again. 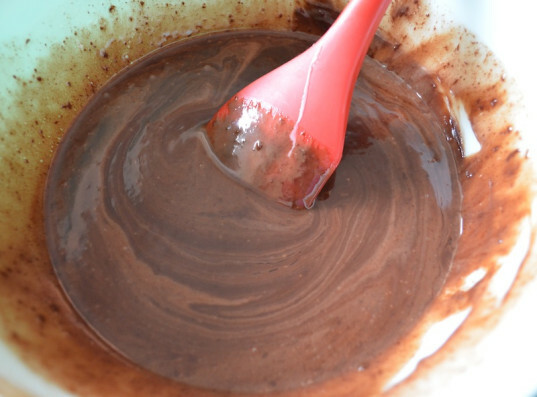 Cover the bowl, and place the chocolate mixture in the refrigerator for about 5-6 hours until it has hardened. You can also place the mixture (covered) in the freezer for an hour and a half to two hours. Either way, you want the chocolate mixture to be firm but scoopable. I tried the fridge method first, then the freezer method and I prefer the freezer method. Note: If you are making the truffles ahead of time, I recommend rolling the truffles out and leaving them uncoated/topped until you are getting close to serving them (so that the candy cane topping stays crisp and the colored sugar colors don't bleed.) You can proceed to step 8 and then coat/top them when you take them out to serve.